We’ve made it – it’s almost 2018!! Thank you for welcoming me into the position of Organizing Director with CAGJ this past year. This experience has affirmed for me that it truly takes a community to build a movement. You are part of this community! Can you make a tax-deductible donation today to strengthen our grassroots organizing in 2018? Without a doubt, 2017 was an intense year of injustice all over the world. In our country alone, the impacts of racist, homophobic and transphobic leaders serving their interests at political whims are unbearable. The costs of climate change for poor folks and farmers have been devastating around the world, while democracy is increasingly jeopardized by growing state repression and old and new waves of colonialism and imperialism. Yet the incredible resilience of grassroots movements has shown us time and time again that even in the face of such gross injustice, communities will continue to educate, organize, and resist to build the world we want to see. 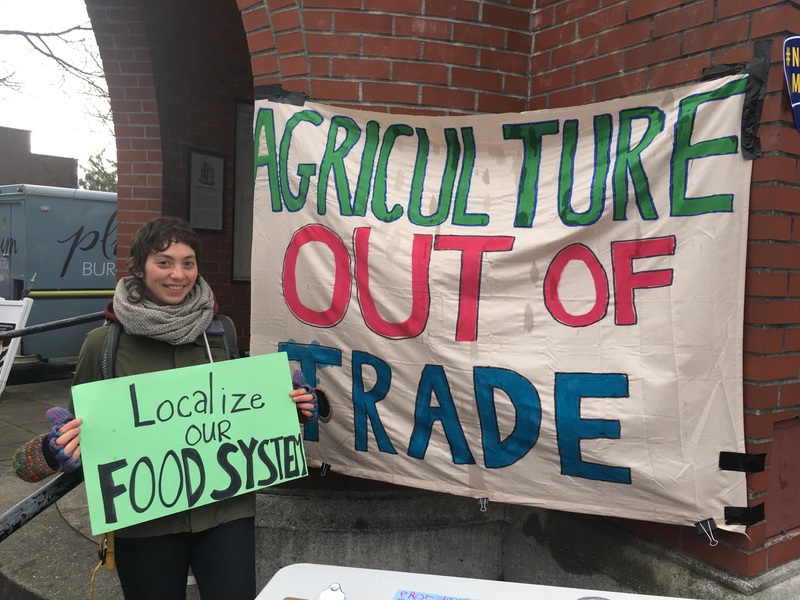 CAGJ is doing just that, and we rely on the support of people like you to sustain our work at the intersections of local food justice and global food sovereignty. I am inspired by Seattle’s food justice movement, and proud of the ways CAGJ has strengthened and mobilized toward many successes this year with our solidarity campaign partners. And I’m humbled by the small-scale farmers we work with across Africa who are fighting for the right to grow food in a culturally appropriate way without the toxic takeover of corporate agriculture led by Bill Gates and the like. We have big plans for our AGRA Watch campaign in 2018: Several of our leaders aim to travel to Africa to meet with our partners on the ground. I’m excited about strategizing with them to stop the Gates Foundation’s influence on agricultural policy which is making it harder for farmers to feed their communities and maintain biodiversity. The farmer and farmworker delegates from the recent South Africa-US Agroecology Exchange we co-organized have been sharing their reflections in a series of articles; their powerful stories illustrate the importance of such transnational exchanges in making connections to resist systemic oppression and build a global movement for food sovereignty. Can you make a donation to support us in making this trip, so we can learn directly from the leaders of the African food sovereignty movement? We are making another big commitment this year to strengthen how we organize for racial justice across CAGJ — in our organizing committees, campaigns, leadership, and political education with our members and the community. I am honored to be participating in an intensive anti-racism training with the Catalyst Project, and look forward to integrating new perspectives into the work of CAGJ. With a mostly white base of members and supporters, the time is now to lift up racial justice in how we talk about, think about, and organize intersectionally in food movements. We stand on many great leaders’ shoulders in this work, and I hope you will join me in this commitment to racial justice. By making a donation today, you are investing in anti-racism organizing through political education trainings like our upcoming CAGJ “summer school” and our campaign to stop genetically-engineered salmon and demand respect of Coast Salish Tribes and native Treaty Rights. I am truly humbled by how many members and volunteers give their time and funds to make our work possible: thank you so much. Please consider becoming a monthly Sustaining Member or make a one-time tax-deductible contribution to support our work for racial justice and food sovereignty in 2018 and beyond! P.S. Help us reach our year-end goal of $3000 annually in new Sustaining Member donations! Sustaining Members agree to have funds automatically deducted from their account, allowing CAGJ peace of mind, and more time to focus on organizing. If you are not already a Sustainer Member, please consider becoming one today, at $20/month, or whatever amount you can afford! Me at our recent action for food workers rights everywhere in solidarity with La Via Campesina.